What does the future hold for Michigan Basketball? In short, it has the potential to be bright. It falls short. 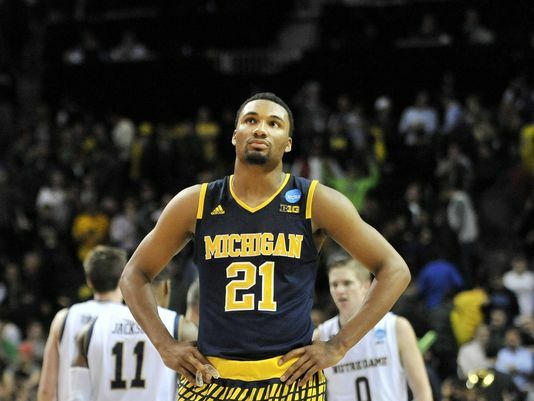 As the buzzer sounds, Michigan stands alone on the court, expressionless in the wake of defeat. After only twenty short minutes, the Wolverines are out of the tournament. A twelve point lead at the half, gone. Seem familiar? That’s because it should. Michigan Basketball’s centennial season could not be more of a dichotomy if it tried. At times, it seemed Beilein’s team couldn’t be stopped, following upset victories over Maryland and Purdue. At others, inexplicable melancholy swept the faces at Crisler Arena, following devastating losses to teams like Iowa and Ohio State. In all fairness, Michigan began its tumultuous season quite a leg down from the competition. Both Caris LeVert and Spike Albrecht left early in the year due to injury, leaving the team without any senior leadership. LeVert’s departure especially hurt the Wolverines, as his presence on the court brought both an average of seventeen points per game as well as an astronomically high 50% shooting from the field. However, excuses only cover so much. Michigan’s problems stem far further than injuries and leadership; rather, they come as a result of a broken offensive system. John Beilein is an incredible man, one of the best coaches in college basketball and clearly knows more about the game than myself. But at this point, there’s no denying the problems that plague his team. What then is the future, the road ahead, for Michigan Basketball? Simply put, there is work to be done, but we have the tools to succeed. Take for example the implementation of arguably the team’s greatest weapon–outside shooting. Michigan leads the Big Ten in 3-point attempts per game with a whopping twenty-five per contest on average, taking up a solid majority of offensive possessions. Such a high-risk high-reward strategy can work wonders for the team at times. In the first half of the Notre Dame game for example, Michigan shot nearly 57% from behind the arc, netting twenty-four points and carrying the team to its twelve point lead at the half. At other times, it can damn near kill us. The second half of the same Notre Dame game provide a perfect example of how a team so heavily reliant on outside shooting can crumble if the shots do not fall. For the remainder of the game, Michigan made only three-of-thirteen three-point attempts, for a dismal percentage of 23%. That’s a thirty-four point drop–one that cannot possibly sustain wins at all, let alone in high pressure situations. With Michigan’s offense dominated by an inconsistent long range effort, what naturally follows is an equally inconsistent short game, led by infuriatingly ineffective isolation matchups. For professional teams like the Lakers or Cavaliers, putting the ball in the hands of your best player may be a smart decision. For us, not so much. We need only examine Michigan’s performance against Northwestern in the Big Ten tournament for evidence of this. In an overtime win that the Detroit Free Press described as a “survival”, the team turned to guard Derrick Walton Jr. to lead the charge on offense. Instead, he blanked. Walton went 0-7 from the field, scoring a measly two points from free throws and nearly costing his team the game. The same type of letdowns come from Irvin’s isolation play as well. Against Notre Dame, Irvin quickly took control of the offense in the second half. Rather than setting up a play, he often took the reigns in his own hands and either drove viciously to the basket or pulled up for a contested three. How did that work out? He shot merely 25% from the field, sinking only one of his nine three-point attempts. What then is the future, the road ahead, for Michigan Basketball? Simply put, there is work to be done, but we have the tools to succeed. Watching the team at both its best and worse throughout the year, I saw the potential next year’s team will have. And it all starts with the fundamentals. With LeVert off the court, the Wolverines vastly improved their effectiveness as a team. Rather than directing all shots to one particular player, the entire team worked together, setting screens and creating wide open looks. Teams like Purdue rely heavily on this strategy, scoring nearly 70 points per game without focusing on only one player. It’s an offensive pattern that works effectively and, more importantly, is consistent. Additionally, with the departure of two seniors, multiple Wolverine stars look eager to take their places. Most impressive of all was freshman Moritz Wagner, who dominated on the defensive end during both the Big Ten and NCAA tournament. While against Tulsa he was not necessarily an offensive superstar, his presence on defense and eight total rebounds proved his worth to the team, and ultimately led to a win. Over the years, Wagner will only grow in both offensive and defensive prowess, and will hopefully develop a post presence that has been missing for years. Rising junior Muhammad-Ali Abdur-Rahkman also proved his worth throughout the year. In the final five games of the season, Rahkman averaged around sixteen points per contest, while shooting nearly 50% from the field. Rahkman’s role on the court has only grown in his second year as a Wolverine, and hopefully his role will continue to expand in his final years on campus. Over the years, Wagner will only grow in both offensive and defensive prowess, and will hopefully develop a post presence that has been missing for years. Both fans and analysts alike have much to look forward to as Michigan enters the offseason. It seems that Beilein’s Wolverines will always find a way to defy all odds and capture a winning season, and this year was clearly no exception. Next year’s team has tremendous potential to succeed and travel even further in the tournament, and will finally have the senior leadership it deserves in Walton and Irvin. As the tournament continues, Michigan will be behind the scenes, preparing to wipe the floor next season, capture a Big Ten title and definitely make a statement in the NCAA tournament. It will be a long wait for fans across the country, but with so much potential for growth and success, it will likely be more than worth the wait. In the meantime, fans can take solace in the fact that State lost too.